Thames Valley Cross Country League Round 2 – This weekend! The second round of the TVXC League is this Sunday 21st October. The venue is the same as when TVT hosted last time in February 2017 and is at Heath Warren Wood with parking about a 10 minute walk away at St Neots School (RG27 0PN). The school is on St Neots Road, west of Eversley just off the A327. Parking is in the school. Please lift share wherever possible and take guidance from the car park marshals to ensure they can maximise the car parking space. The race start and finish are just across Bramshill Road from the school (marshals and signs will direct you). Please ensure you arrive in plenty of time to run, allowing plenty of time to get from the car park to the start. Please check in with Captain Claire who will be situated near to the start/finish area from about 10am. The course will be a 9.5k route around Bramshill Common Wood on mixed terrain of forestry paths and trails so spikes are not recommended. The biggest turnout of SJs was at Frimley Lodge where sixteen members were amongst the 485 runners who braved the downpours on a surprisingly fast morning. Alistair Ingall-Tombs was a first timer at the venue and also the first member to finish. Gabbi Bassett and Jane Bannister both recorded Season’s Bests while Leon Hicks limbered up for another century as he completed 99 runs at the venue. Another big turnout of members at Great Hollands Rec for Bracknell parkrun with 15 of the 285 runners part of Sandhurst Joggers. Jackie Kent finished first in the VW45-49 age category. There were a slew of Season’s Bests by Ian Watson, George Green, Amy Gates, Fiona Marshall and Serena Gigg. Serena narrowly missed out on a Bracknell course record by 1 second! Matt Jones was first member into the finishing funnel. Parkrun Rushmoor was the place to be for PBs with Fran Dimmock running the course for the first time to record an outright best. Paul James returned to Rushmoor to also record an improvement. Well done to both of you. Mo Willcox was also a first timer here. Martin Gould was first member to finish and Louisa Enriquez did a brilliant job of pacing 30 minutes – just 1 second away from her target! Dinton Pastures proved to be popular yet again attracting seven members including a core of SJ regulars and some first timers. John Barnes ran his first ever parkrun while Colin Carpenter and Teresa Milroy tried the venue for the first time. A course record was snagged by Harvey Young. Covering the local tourism first; Jane Pond, Jane Ralls and Lyn Winter ran at Reading with Jane Ralls recording a course record. Kate Parker celebrated a friend’s birthday at Basingstoke and Dave Ayling came within 3 seconds of his best time at Woodley. John Tovell and Andy Summerskill ran at their regular venues; Crane Park and Houghton Hall respectively while Robert Jerrett took a trip down the M3 to Winchester. Heading to the midlands Andrew and Frances Parkes ran at Coventry and further north still Lisa Hale and Stuart Overhill took it easy at Heslington near York University ahead of the Yorkshire Marathon and 10 miler. Iain McCready took on the 60 mile Ultra; The Pony Express in the New Forest. Running back to back 30 milers is a tough proposition at the best of times so Iain did exceptional well to nurse himself around the course while suffering with Plantar fasciitis. Graham Robinson ran for Bournemouth at the first match of the 2018/19 Hampshire Cross Country League finishing in 38th position. The Rushmoor Wellesley 10k starting from Queens Parade Aldershot was hugely popular with members who enjoyed a great run on a course centred around the Basingstoke Canal and included some XC ‘features’ which were made trickier by the torrential rain. Here are the SJ results and we’ll run a highlight feature later in the week. The eleven members at the Cabbage Patch 10 mile event wondered if their should have brought flippers instead of running shoes but the conditions didn’t stop a number achieving PBs. Lisa hale had a great run at her fourth participation of the Yorkshire marathon finishing in 3:21:07 to beat a PB that has stood for 12 years! This also made her the 24th female finisher and 5th in category. Stuart Overhill ran the accompanying 10 mile event finishing in a great time of 1:10:43 despite his shoelace coming undone at seven miles! 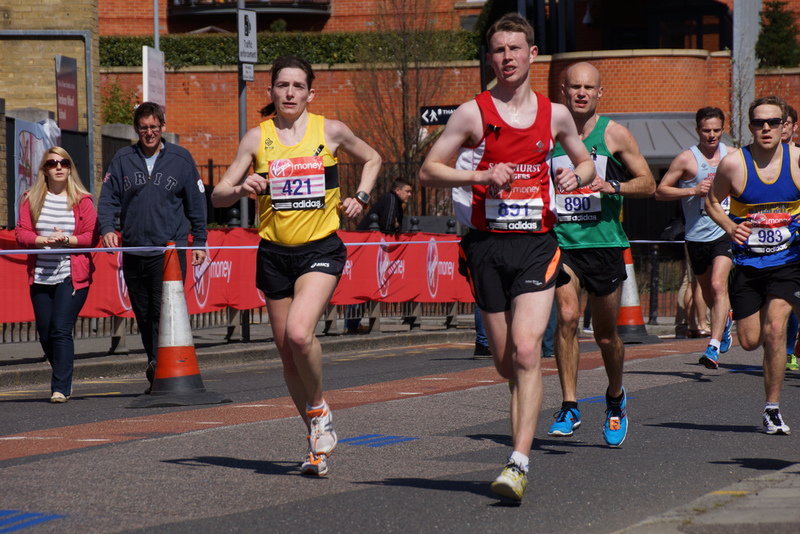 The streak continues for Jim Laidlaw as he PB’d at the Shoreditch 10k. Going under 40 minutes for the first time… just! With a 39:58 finishing time. Jacq Hudson continued her Half Marathon crusade by completing the RMR Goodwood Half Marathon on the Goodwood Motor Racing circuit. She finished in 2:20:51, her second fastest time ever with impressively consistent splits. Tina Acock and Lance King completed the LDWA 22nd Founders Challenge on a 46km course around the Surrey Hills. The course was scenic but tough with nearly 1200 metres of vertical. Seven brave souls took on the hills, sand and torrential rain at Frensham Ponds in memory of Lucy Zirbser who died in August. Jackie Kent will have a full report later in the week. It was another big week on Strava and we hit the century mark once again with 100 members logging runs. Thanks to his massive weekend Iain McCready took the top spot narrowly missing completing 100km himself. Monday: Patrick will be back at the helm for the Monday night chatfest from Sandhurst Sports Centre at 7:30pm. The route will cover approx. 6 miles and is back on the road so don’t forget your head torches and high viz. This is one of the most sociable runs of the week and a great opportunity to catch up with friends or discuss the preceding weekend. Sunday: Next Sunday is the second round of the Thames Valley Cross Country League being hosted by TVT at the Heath Warren course near Eversley. Cross Country Captain Claire has already emailed all the details and a summary can be found at the start of this Run Down.